Laura Ross Wolcott (1834-1915) was the first female doctor in Wisconsin and an important leader of the woman suffrage movement in Milwaukee. She was born in Maine, educated in Boston, and graduated in 1856 from the Female Medical College of Pennsylvania in Philadelphia. She came to Milwaukee in 1857, opened a private practice, and later became a consultant at several of the city’s hospitals and at the Industrial School for Girls. In the 1860s, she applied for admission to the Milwaukee County Medical Society, but a decision was delayed, allegedly because they hoped she would “quietly withdraw her application.” As she awaited their decision, Ross served as a commissioner to the 1867 World’s Fair in Paris and also took classes in medicine at the Sorbonne. After her return to Milwaukee, she finally gained admission to the Medical Society in 1869. Following her marriage that same year to Dr. Erastus B. Wolcott, a leading doctor in the state, Ross continued her medical practice and became a leader in the cause of women’s suffrage. In 1869, she helped to organize a convention for women’s rights and was a founder of the Wisconsin Women’s Suffrage Association, serving as its president in 1882. Widowed in 1880, she continued to practice and moved to the Ravenswood neighborhood of Chicago, Illinois in 1894. ^ Dr. Laura J. Ross Wolcott, Findagrave.com, accessed June 15, 2015. ^ Victoria Brown, Uncommon Lives of Common Women: The Missing Half of Wisconsin History (Madison, WI: Wisconsin Feminists Project Fund, Commission on the Status of Women, 1975). 25. ^ Brown, Uncommon Lives of Common Women, 25; Bayrd Still, Milwaukee, The History of a City (Madison, WI: The State Historical Society of Wisconsin, 1948), 205. ^ History of the Medical Society of Milwaukee County, Medical Society Milwaukee website, accessed June 15, 2015. Brown, Victoria. Uncommon Lives of Common Women, The Missing Half of Wisconsin History. Madison, WI: Wisconsin Feminists Project Fund, Inc., Commission on the Status of Women, 1975. Thayer, Earl R., and Steve Busalacchi. “First in Their Class: Wisconsin’s Pioneering Women Physicians.” Wisconsin Academy Review 51, no. 2 (Spring 2005): 51-62. Laura J. Ross Wolcott’s life has been frequently if imperfectly documented, and our entry reflects the ambiguities in the source material. A good example is a piece in the Wisconsin State Journal, headlined, “Laura Ross Wolcott (1834-1915),” which then leads with the sentence, “Wolcott was born in Maine in 1826.” As was common at the time, she was also known by her married name, “Mrs. 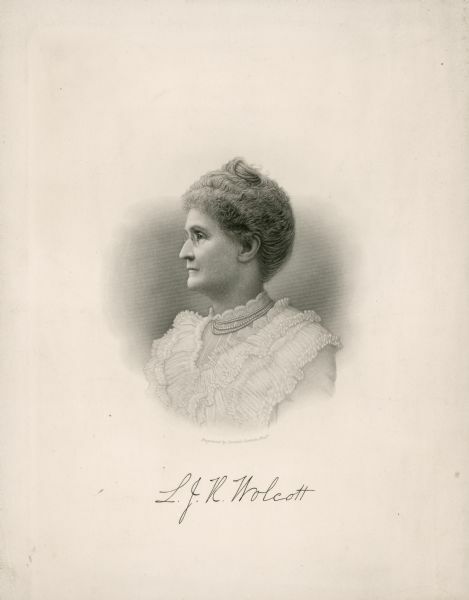 E. B. Wolcott,” as well as “Laura J. Ross.” That she faced discrimination as a woman doctor is not in dispute, but the circumstances of her admission to the local medical society and her relationship to her future husband, Erastus B. Wolcott, who advocated her admission before they married, are subject to contradictory evidence. Did they travel together to Paris in the years after the Civil War? When did Wolcott first apply for admission to the medical society? There are separate reports of Governor Fairchild nominating Ross and Wolcott as Commissioners to an exposition in Paris in 1867. We know that Ross and Wolcott married soon after she was admitted to the local medical society. We know this was his second marriage, and he was 30 years older than she. He died in 1880; she remained a prominent Milwaukee suffrage advocate and physician in her later years. We know she commissioned the statue of Wolcott in Lake Park at her death. What else can we find out about this fascinating woman? ^ “Laura Ross Wolcott (1834-1915),” Wisconsin State Journal, May 3, 2017, accessed June 6, 2017. The Wisconsin Medical Journal reports her birth as 1831; Wisconsin Medical Journal 14 no. 8 (January 1916): 366, accessed June 6, 2017. ^ See the description of her career in Louis Frederick Frank, The Medical History of Milwaukee: 1834-1914 (Milwaukee: Germania Publishing Company, 1915), 34. ^ “Wisconsin’s First Woman Doctor Faced Jeers—And Finally Cheers,” Madison Capital Times, August 13, 1963, https://newspaperarchive.com/madison-capital-times-aug-13-1963-p-11/, accessed June 6, 2017; Earl R. Thayer and Steve Busalacchi, “First in Their Class: Wisconsin’s Pioneering Women Physicians,” Wisconsin Academy Review (Spring 2005), 52, last accessed July 2, 2017; Laura Ross Wolcott, Wisconsin Women Making History, accessed June 6, 2017. ^ Elizabeth Cady Stanton, Susan Brownell Anthony, Matilda Joslyn Gage, eds., History of Woman Suffrage, Vol. 3 (Rochester, NY: Charles Mann Printing Co., 1886), 640; “Obituary, Surgeon General, E.B. Wolcott,” The Chicago Medical Journal and Examiner 40 (February 1880), 215, accessed June 6, 2017. ^ “General Wolcott Bronze Statue near Lake Park Lighthouse,” Wisconsin Historical Society, accessed June 6, 2017.